SYDNEY, Australia -- More than 100 houses were destroyed by a Christmas Day wildfire that tore through a stretch of coastline popular with tourists in southern Australia, forcing thousands to flee their homes, officials said Saturday. Cooler weather and light rain on Saturday eased the immediate threat from the blaze along Victoria state's scenic Great Ocean Road, but officials warned that it could continue burning for weeks. No one was killed or injured in the fire, said Victoria Emergency Management Commissioner Craig Lapsley. This koala was rescued from the brush wildfire and fed water by a first responder. "You've got to stand proud to say that people are with us - that is, they've walked away from the fire that had every potential to be a killer," Lapsley said. Hundreds of firefighters spent Christmas battling the blaze, which was triggered by a lightning strike. 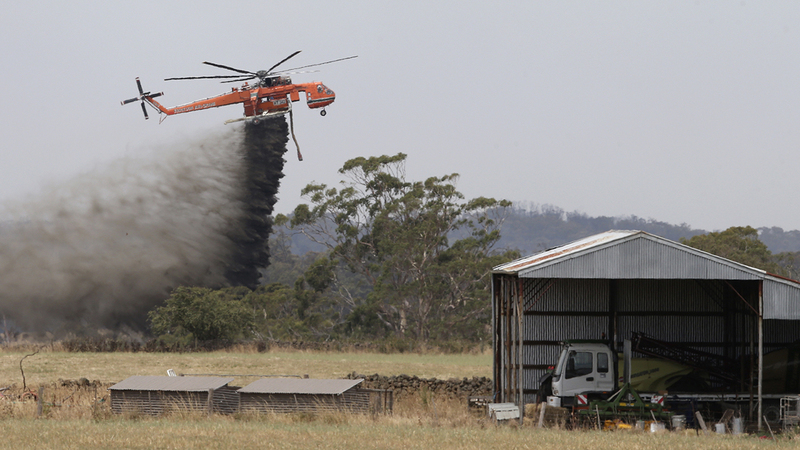 The fire destroyed 116 houses in the small towns of Wye River and Separation Creek, Lapsley said. Many of the properties destroyed were holiday homes. The fire has temporarily closed a section of the Great Ocean Road, which winds along Victoria's coastline and past the region's famed "Apostles" - a collection of giant limestone stacks that jut dramatically out of the sea. Destructive wildfires are common across much of Australia during the southern hemisphere summer. In 2009, wildfires killed 173 people and destroyed more than 2,000 homes in Victoria.